The Dog-Powered Scooter. Hmm... let's just look at paired-up pros and cons, shall we? 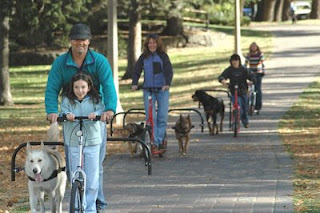 PRO: Your dog gets some excercise. CON: You don't, lazy bones. PRO: With a job serving his master, your dog feels useful. CON: Enslaving your dog for your convenience, you feel guilty. PRO: You get outside the house! PRO: From the site, "YOU WILL LOVE THE TOTAL STABILITY OF THE TRIKE." CON: Nope, your face will be hitting the pavement soon. ...dog chases cat, bike chases dog, lawyer chases ambulance... need I say more?